There are several exercises that must be successfully completed in order to pass Module 1. The slow ride being one particular exercise that we shall concentrate on. 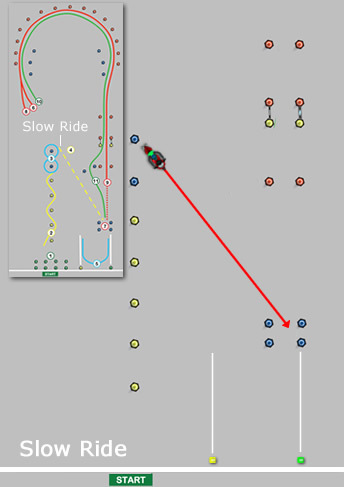 Upon completion of the figure of 8 exercise, the slow ride provides a ‘link’ for moving on to the U-turn exercise. During Compulsory Basic Training, Element C, you’ll have practiced moving the motorcycle at slow speeds along with the ability to maintain balance. You’ll be asked by the examiner to ride slowly in a straight line (this doesn’t need to be precise, a reasonably straight line is sufficient). This will be along a predefined route explained by the examiner and which can be seen in the diagram below. This exercise is to simulate a situation such as riding in slow moving traffic. Riding slowly tests your sense of balance. Some riders have a better sense of balance than others and therefor some riders naturally find the slow ride exercise easier. For those that find it difficult, the best course of action is simply plenty of practice. You’ll find the slow ride exercise easier if you are proficient in the use of the throttle, clutch and rear brake. Depending on the test centre that you attend, circuit layouts may vary and be to the left or right. The diagram below represents a typical ‘right circuit’ used at many test centres. Before starting the slow ride exercise, safety observational checks are essential. You’ll be expected to ride at a slow walking pace. Don’t worry about precise speeds here as you’ll need to keep your eyes focused on where you are going and not where you are at the moment. This will help with your balance. So, keep your head up, eyes focused on where you intend on going and not on the ground in front of you. Keep the revs up at around 3000 rpm should be sufficient (this may vary depending on circumstances such as weight and vehicle used) and control your speed using the clutch (slipping) and not the throttle. Too little revs or rpm may result in a stall. Grip the handlebars lightly and try to relax as this will aid in your balance. Your speed isn’t measured here, but if you feel your speed increasing over a slow walking speed, gently apply the rear brake to slow down. Stop the bike with your front wheel in the blue cone gate area.